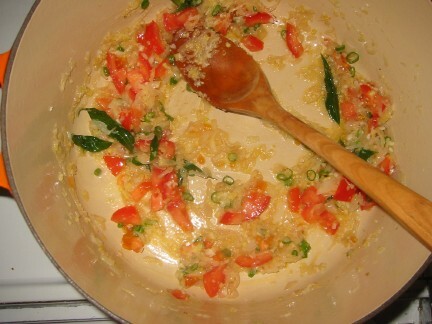 This thiyal is an adaptation of a Keralan shrimp recipe. The curry is made with a dark, sour sauce of toasted grated coconut, tamarind and browned onion. Like many Keralan dishes, it is anointed at the end with an oily stir fry of dried red chiles, curry leaves and mustard seeds. It’s deeply complex & satisfying. The original recipe is for seafood which makes me wonder whether it didn’t call for kodampoli (also known as “fish tamarind”) rather than regular tamarind. The recipe comes from Maya Kaimal’s Curried Favors, which doesn’t ever call for kodampoli though it is a common ingredient in this part of India. 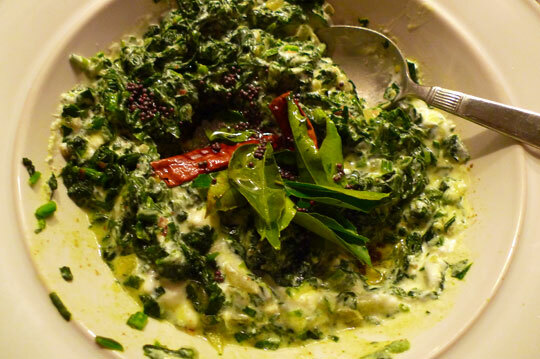 I served it with spinach pachadi from the same book. This is a failsafe recipe – easy and delicious. The coolness of the yogurt plays off the spiciness of the chiles. 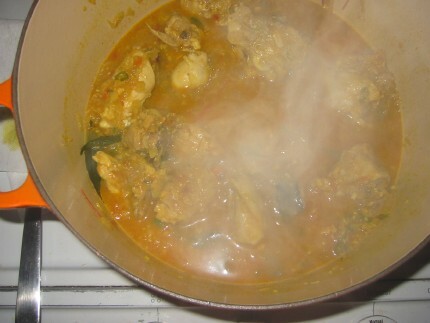 The earthiness of the spinach and curry leaves permeates the entire mixture. 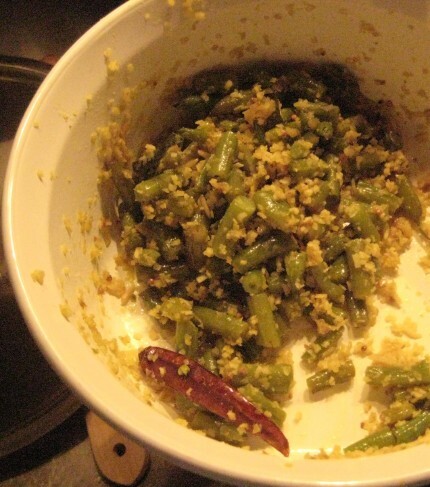 This dish from Kerala is a thoran, sort of a warm salad. It’s pleasingly bitter, sweet and fresh-vegetably all at once. I fried the beans in raw organic coconut oil from Bonobo’s. 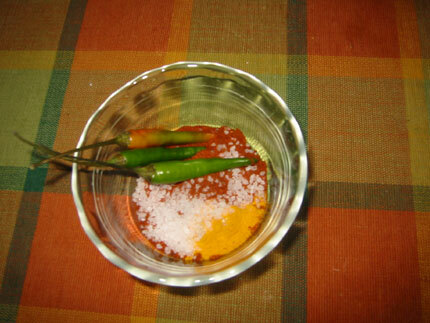 The oil is heated and quickly flavored with mustard seeds, fresh curry leaves, dried red chilis and a small amount of uncooked white rice — rice is used as a condiment in Southern Indian food. 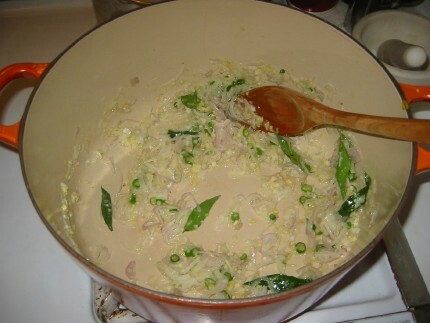 The beans saute in the oil for 2-3 minutes, and then you move them to the sides of the pan in a donut shape and put a mountain of chopped vegetables, herbs and spices in the hole in the center: shallots, garlic, ground cumin, turmeric, green chilis and grated fresh coconut. The beans are mounded over the ingredients, water is added, and the beans are then steamed through the pile as it were for 10 minutes or until done. We served this Madhur Jaffrey dish with Julie Sahnee’s tandoori chicken. I broiled it rather than roasted it and it came out a bit dry and charred, but still flavorful. Last time I made it into chicken makhni and I think that’s what I’ll do next time. An assortment of pickles and chutneys, plus Jaffrey’s apple-cumin-ginger yoghurt, rounded out the meal. More and more I find myself captivated by the cuisine of the southwestern Indian state of Kerala. It is less sweet and meaty than the cuisines of northern India, and focuses instead on fish, green chilis, coconut, mustard seeds, and oddly, rice used as a seasoning. The tastes are fresh, nutty and crisp, like a breath of cool air. Another ingredient found in most dishes are curry or kari leaves, which have nothing to do with curry but are highly aromatic. The plate above holds shrimp cooked in coconut milk, a Madhur Jaffrey recipe; I used canned milk (but a reputable brand recommended by Su-mei Yu); it is offset by an ingredient called kodampoli or fish tamarind, which is smoky and sour. Kodampoli is not tamarind at all and is hard to find – I used lemon juice. 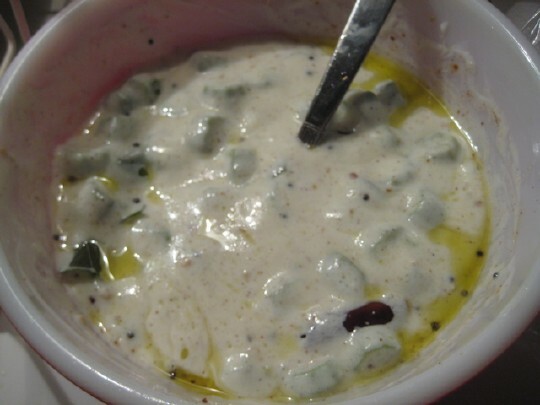 The other dish is another Keralan favorite that I’ve written about here before, okra with yogurt. I could eat buckets of it. 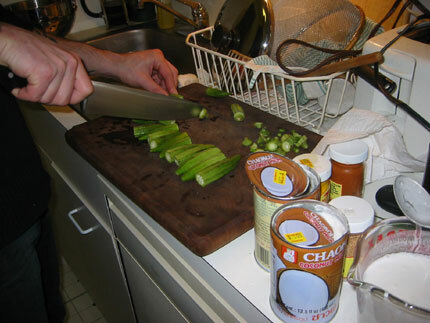 OK, I may have gone crazy with this okra thing, but it’s actually a fantastic vegetable. Wholly underrated, Americans have learned to hate it because when cooked with water it loses all its texture and deflates into mush. Indians never allow water to touch okra. Above is actually a leftovers plate from a dinner I made a couple weeks ago before the Mission Of Burma show in Williamsburg (which was great, if deafening). Both dishes are, again, from Kerala, and feature the ubiquitous kari leaves (or curry leaves – not that there is anything curry-ish about them as we understand that word). 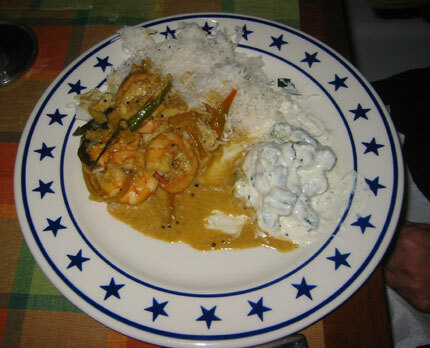 The prawns in coconut milk use a substance called kadampoli to add a sour tincture. I was unable to find it; you can substitute lemon juice, but I used tamarind instead. (Kadampoli is also known as fish tamarind, but in fact is unrelated to tamarind, all incredibly confusing.) 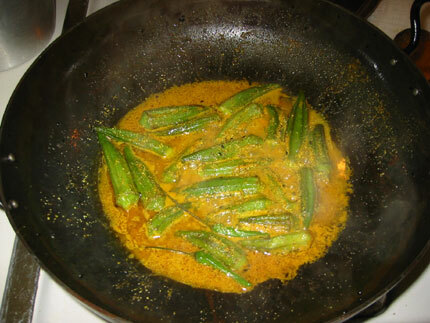 The other dish is okra that is stir-fried in spices in oil and then folded into yogurt; meanwhile you fry some more spices in the okra-flavored oil and then fold that into the okra-yogurt mixture. It’s more-ish. A couple of Madhur Jaffrey classics last night. 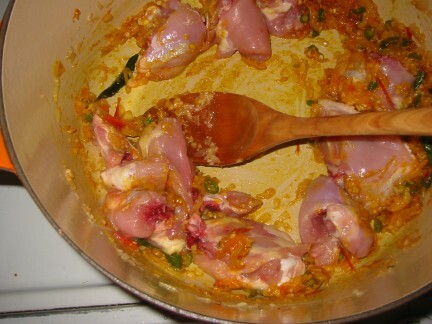 The green chili chicken is a southern Indian dish from Kerala state, specifically from the Jewish community in Cochin. It was the dish served at Friday night supper, for the Sabbath. Despite the name it is not particularly spicy – the chiles lend it some bitterness. The other key ingredients are the typically Keralan kari leaves and, for sourness, tamarind that has been soaked and strained to form a paste. The chicken is braised, bone-in. I served these dishes with basmati rice, and for cooling purposes and textural contrast, cold onion and cucumber relishes.